The GSD is a working breed and does have certain characteristics that you need to consider if you live in a busy household. Although a well bred GSD should be bold and confident they should be a little stand offish with strangers. 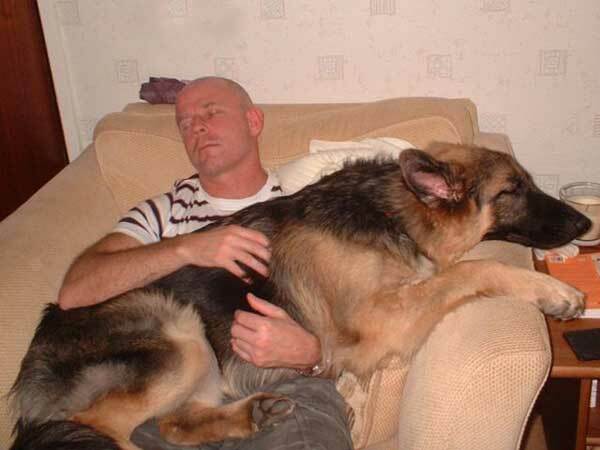 What many new owners find difficult to cope with is the territorial and protective nature of the GSD. You never have to train a GSD to guard your family and home. Most GSD's will bark if someone comes to your door and most need to be introduced correctly to guests that come to your home. If a German Shepherd is well socialised at an early age and attends training classes, this should reduce this problem to some extent. This will also help your dog learn to interact with other dogs. It seems pretty obvious to most that this is a large dog but we wish we had a fiver for every person that has asked us to rehome their dog because 'it grew too big'!! 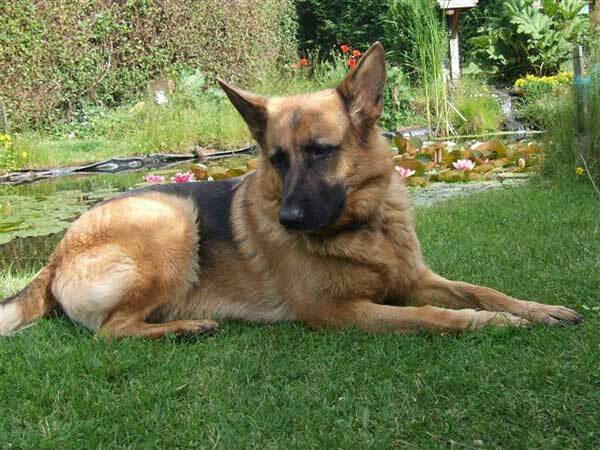 A German Shepherd is a large breed with females averaging 30-35kgs and males 35-40Kgs. They also have very thick long tails which they like to wag a lot so if you have any low lying ornaments or anything else fragile - beware. Both short coated and long coated GSD's moult once a year. Unfortunately it lasts for 365 days so you will need to brush regularly. They don't need bathing very often as they are very good at finding water to bath in. They usually prefer the really dirty muddy bathing areas. There is not much difference when it comes the long and short coats - they both moult as much although the long coats will require more brushing to avoid their coats becoming matted. Feeding is usually straight forward and meals should be divided into 2 a day to reduce the risk of torsion. As the GSD is a deep chested breed, always better to split the meals rather than give one huge one. Feed either a good quality dried or a mix of meat (preferably not tinned) and biscuit. GSD's often have sensitive stomachs so it might take a while to find something that suits and that he likes. Avoid highly coloured foods, wheat and any flaked foods. Don't feed your GSD junk food and loads of titbits. Many dog owners now favour a more natural diet and there is plenty of information available if you wish to go down that route. There is loads of info on the BARF diet on the web. Apart from the obvious costs such as feeding which should be no more than £1 per day, there are other costs to consider when contemplating owning a GSD. Because of the ever rising costs of veterinary treatment, we ask all adopters to take out pet insurance. Cost will vary according to provider and level of insurance. If you are planning to go on holiday and not take your dog with you, you will need to consider the cost of kenneling for which your dog will need the appropriate vaccinations. You will never go to the toilet alone again, you will never have your chair all to yourself again and you will never be lonely ever again! !